The white-bellied drongo (Dicrurus caerulescens) belongs to the family of drongos, the Dicruridae. The white-bellied drongo species is distributed in India, Nepal and Sri Lanka. These drongo species are insectivorous and have forked tail. These drongos are polytypic species. The white-bellied drongo (Dicrurus caerulescens) is a medium-sized drongo, measuring 25 cm in length and weighing 40 to 42 grams. The adult white-bellied drongo has blackish upperparts. The throat and breast are gray. The belly and vent region are whitish in the nominate subspecies. The Sri Lankan subspecies have whitish vent area. There is a dark forehead band. The lores are black. The stout bill is steel gray. The upper mandible is hooked at the tip. The irises are reddish. There is a pale gray eye-ring. The legs and feet are gray and short. The call of these white-bellied drongo species is a loud fluty whistling sound. 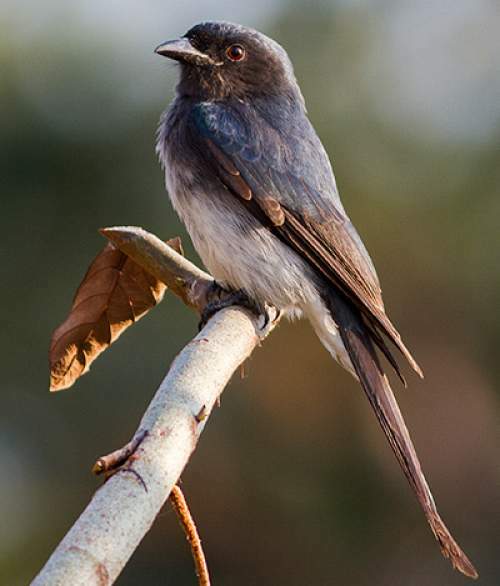 These white-bellied drongo species are distributed in India, Nepal and Sri Lanka. The nominate subspecies D. c. caerulescens is distributed in India and Nepal. The white-bellied drongo subspecies D. c. insularis is distributed in north and southeast parts of Sri Lanka. The subspecies D. c. leucopygialis is distributed in southwest Sri Lanka. 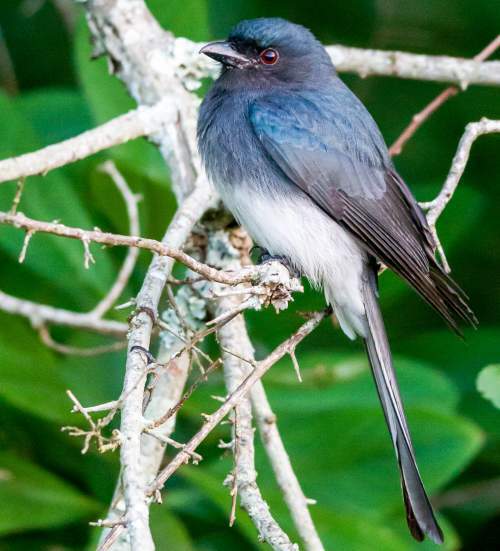 In India, these white-bellied drongo species are distributed in the states of Tamil Nadu, Kerala, Karnataka, Andhra Pradesh, Telangana, Maharashtra, Gujarat, Rajasthan, Haryana, Uttar Pradesh, Uttarakhand, Bihar, West Bengal, Jharkhand, Chhattisgarh and Odisha. Some of the Important Bird and Biodiversity Areas (IBA) of these white-bellied drongos in Nepal are, Parsa Wildlife Reserve, Ghodaghodi Lake, Dharan forests, Chitwan National Park, Bardia National Park, Farmlands in Lumbini area and Barandabhar forests. These white-bellied drongo species have moderate forest dependence. They normally occur in altitudes from 0 to 2000 meters. The artificial ecosystems and habitats of these species include heavily degraded forests, plantations and rural gardens. The natural ecosystems and habitats of these species include tropical and subtropical dry forests, dry savanna, open forests, scrub jungles, moist deciduous forests and bamboo forests. The diet of these white-bellied drongo species consists mainly of flying insects. Crickets, cicadas, grasshoppers, locust, moths, dragonflies, airborne spiders, winged termites and ants are their primary food. The white-bellied drongos are known to take nectar from large flowers of Bombax and Erythrina species. They are also known to prey on small birds. They are known to join mixed species foraging flocks. They feed from the canopy by hawking flying insects. They catch larger insects with their claws. They also glean insects from the branches and foliage. The breeding season of these white-bellied drongo species is from March to June in most of their range in India and Nepal. The laying season is from February to June in Sri Lanka. These drongo species are monogamous and highly territorial. The nest is usually built in a fork of a tree. The cup-shaped nest is mostly built with twigs and is lined with grass. The drongo clutch contains two or four pale pinkish-orange eggs with reddish blotches on the broader end. Both the parents incubate the eggs. The chicks hatch out after 14 to 16 days and fledge after fifteen days. These white-bellied drongo species are non-migratory resident birds. Some non-breeding populations are found in parts of Gujarat in India. The global population size of the white-bellied drongo (Dicrurus caerulescens) has not been quantified. The overall population trend of the species is not known. In most of its range, this drongo species is reported to be generally uncommon to locally common (Grimmett et al. 1998). The generation length is not known. Its distribution size is about 2,880,000 sq.km. Habitat alteration and destruction, deforestation, human intrusions and disturbance and capture for pet-trade are the main threats that are endangering the survival of these drongo species. The white-bellied drongo (Dicrurus caerulescens) does not approach the thresholds for being Vulnerable, either under the range size criterion, or under the population trend criterion or under the population size criterion. The IUCN (International Union for Conservation of Nature) has categorized and evaluated the drongo species and has listed it as of "Least Concern". The CITES (Convention on International Trade in Endangered Species of Wild Fauna and Flora) status is ‘Not Evaluated’ for the white-bellied drongo (Dicrurus caerulescens). D. c. insularis (Sharpe, 1877). Current topic in Birds of India: White-bellied drongo - Dicrurus caerulescens.